When you are new to optimizing your website for the search engines, you are bound to come across contradictory pieces of advice regarding SEO. There will be many pieces of advice that are completely wrong and if you want your SEO campaign to be successful, you will have to stop listening to these pieces of advice. Some of the most common myths often perpetuated are given below. Google has added a lot of other factors to its search algorithms. When websites are being ranked, these additional factors such as social media presence will be taken into account. However, Google has never released an update that has decreased the importance of keywords or eliminated them completely as a ranking factor. On the other hand, using a lot of keywords has been banned by Google. Over optimizing your website with keywords or using a lot of anchor texts that are rich in keywords are activities that you need to stop. Meta tags do not affect the rankings of your website certainly. However, that does not mean that they are unimportant. These tags will help users understand what your website is really about. Even the search engines use them for this purpose. Attractive Meta Tags can increase the number of clicks which is beneficial for your business. An XML Sitemap has nothing to do with the rankings of your website. Instead, they are used by the search engine bots to crawl through your fresh pages and index them faster. An XML Sitemap is essential for your website certainly. However, its importance does not lie in its contribution to rankings. Rather, it is important for making the navigation of your website smoother for the search engine and the user. Google does not like to see websites optimized with lots of anchor texts filled with keywords. However, you should not eliminate them completely. Keyword anchor texts are certainly important for getting a good rank on websites. You simply need to avoid using them too much. One of the most commonly perpetuated SEO myths is that guest blogging does not have any value whatsoever. Guest blogging can still be useful. However, the blogs should be relevant to the niche of your own blog. It should be unique and optimized appropriately with links and anchor text. Search Engine Optimization can seem to be difficult. With a bit of practice and knowledge, you can easily overcome its problems. Instead of listening to such myths, you can conduct your own research into the effectiveness of the various SEO techniques. A young entrepreneur who is looking to launch his or her business online is always at a dilemma. Well, the reason for this is because he or she is completely unaware of the rightful strategy that must be applied for a successful online business launch. However, it is important to note that there are various strategies that must be applied in order to have successful online business marketing. Among all the strategies, the most effective strategy is Search engine optimization or SEO. In order to have a well-strategized search engine optimization it is important to hire a reputed SEO company. There are many SEO companies that are available in the market, but not all of them are efficient enough to provide an impressive search engine optimization strategy. However, in order to be a reputed company for search engine optimization it is important that a company should hire experienced professionals in this domain. It is important for SEO companies to be aware of professionals who have a wrong myth about Search engine optimization techniques or strategies. So, what are those myths? 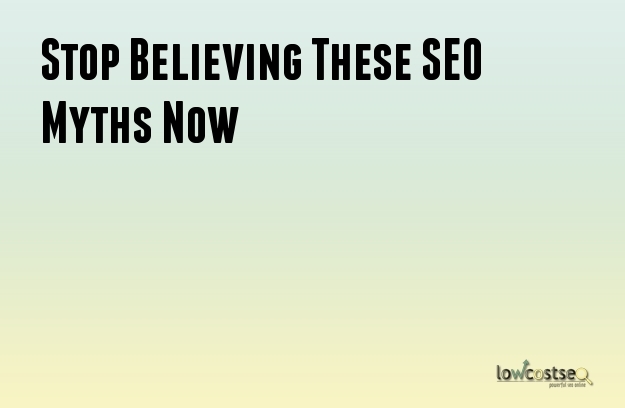 And how can those myths spoil the entire search engine optimization strategy? Here is a list of them. It is a known fact that it is important to write quality contents in order to do a successful online marketing campaign. However, it is also necessary to keep in mind that in order to display quality contents it is important to hire a reputed SEO company without which the content will certainly not have any value. People are in the myth that Google is not fond of SEO. Well, in reality this is not a fact. Google is very much dependent on search engine optimization in order to provide customers with their desired quality content. Google always helps quality content to reach higher in ranking in comparison to other contents. People have a very wrong belief that linking to other websites can increase the chances of losing on potential customers. However, it is important to know that creating a link with other websites can help in increasing the traffic to a greater extent. This will definitely help the business to widen their customer base. For a successful online business marketing, it is important that you do a lot of social activities. However, many people are in the notion that social activities are really not important. Again, one must be alert about the fact that Google basically gets quality contents higher in ranking by watching over the number of likes and comments the content gets. So, it is important to do a lot of social activities for the better display of contents. People are in the wrong notion that longer content are unable to gather the attention of readers. However, the fact is just the opposite. Shorter content lack in-depth description, whereas longer content are fed with in-depth information which most of the readers are basically looking for on the Internet. Keywords: You need ensure that you are on top of the keyword research. Keep a track of the search words that people are using for the kind of content that you provide. Then use it in the blogs, landing pages, and articles for ranking higher in the search engine. However, there should not be over stuffing of keywords. The URL has to be kept short to keep the keywords from being repeated. Take out one keyword for a single content and place it in the URL. Avoid writing content with Google ranking in mind. The content should be informative and of high quality. The keywords have to be made bold and should be italicized to be easily discernible. However, it need not for formatted just for the sake of doing it. Find out innovative ways to place your keywords and this will be productive for your clients. Images: Google prefers ALT text. The parameter of alt is used to describe the content of the image in words. This makes Google rank your website higher as Google ranks your images in the Google Images in the image search result. The ALT text makes the client what the image is all about. And somehow, Google gives credibility to such websites. Internal Links: When you think of linking one page to another avoid texts for anchoring. You should take the assistance of the anchor text to give the user a better experience and simultaneously improve your ranking. If you place a keyword in the anchor text then it will help the user understand what the content is all about. Google will also understand what to rank the page for. This makes it easier for everyone. External Links: Linking the page of the website to some other external page improves the ranking of the website. Google gives credit to those websites that are part of the larger internet community. Again, the page should not be linked to an external factor just for the sake of it for it may have adverse effect on the ranking of the website. Link the page to only reputable external links. Mobile friendly: If you do not have a site that is mobile friendly then it may not affect the ranking of the site in the laptops of desktop computers. However, it may affect the ranking in a mobile device. With the increasing use of mobile devices this is an important factor that you need to look into. You may lose your customers to website that are mobile friendly. The easier way to do this is to make the site responsive. There are various companies that provide SEO packages to improve your website ranking. Loading Speed: The performance of the site determines the ranking of a website. If the content of the page takes time to download then it may lower your ranking in the SEO Services Singapore. Check on the size and format of the image for this.